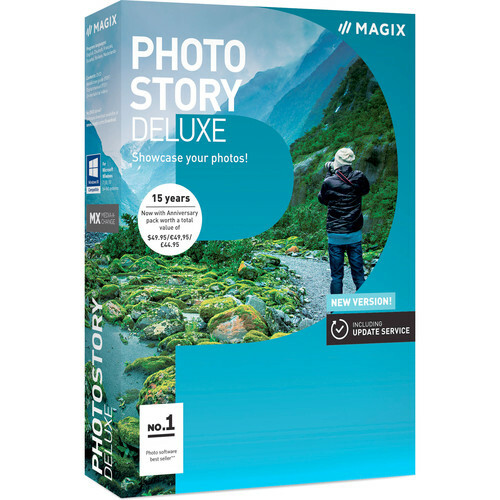 An intuitive tool for producing dynamic multimedia slideshows, the 2017 edition of Photostory Deluxe from MAGIX offers a versatile feature-set to compile still images and videos into a seamless presentation for playback. Photostory Wizard guides you through creating a finished slideshow by sequencing content and adding effects and transitions, and multi-track editing allows for more fine-tuned control over the process. During the creation process, a wide range of tools are available to creatively refine the look of slideshows, including title and text editors, color and image optimization tools, picture-in-picture effects, unique animations to depict travel routes, and an image stabilization tool to correct shaky footage. Audio can also be edited and selected from a built-in library, and photos and videos can be synced up with the beat of a tune for more cohesive playback. Once finished, slideshows can be exported directly to social media sites or mobile devices, as well as discs or for other modes of viewing. Photostory Deluxe supports a wide range of original content, including 360° footage, 3D content, and UHD 4K video, and makes use of full 64-bit speeds from Windows 10, 8, and 7 operating systems for fluent performance. Freely configurable tracks for photos, videos, and other elements of your slideshow for greater overall editing control. Full support for 4K output and 3D content. Updated Photostory Assistant allows you to complete a finished slideshow in just three steps. Full screen editing support for more detailed control. Added design elements, title effects, editing templates, intros, outros, and both manual and automatic photo effects. Direct importing support is available from the cloud or a smartphone. Updated travel route animations for more dynamic travel-themed slideshows. Free feature updates for one year along with unlimited use permissions. User Interface - Large buttons and an easily navigable interface make creating slideshows simple and quick. Storyboard and Timeline modes can be used during creation to give you a total of eight multimedia tracks for editing. Import Wizard - A dedicated wizard helps to expedite transferring media into the application from cameras, drives, and other devices. Quick Access Feature - For a faster workflow, video clips can be viewed and trimmed directly within the Mediapool and then imported into the project's timeline. A unique for producing polished multimedia slideshows, the Photostory Wizard allows you to edit from a large selection of style templates and choose from a library of background music. Cinematic effects can then be added to the presentation, and picture transitions can be timed to match the beat of the music. Using Wi-Fi and the Camera MX app for Android devices, you can transfer imagery directly into Photostory Deluxe for turning live shots into animated GIFs, apply live creative effects and filters, and for sharing directly to Instagram and other social media platforms. Faster Effect Calculation and 64-Bit Speed - Utilizing 64-bit performance, operating and rendering speeds have improved for a faster workflow. Additionally, adding effects to photos and videos has also been accelerated through the use of your computer's graphics processor. Multi-Track Performance - By working in multiple editing tracks, this allows for a more efficient use of multi-core processors for faster, more responsive editing. High-Resolution Slideshows - Support is available for producing slideshows up to UHD 4K resolution. Support for 360° Footage - 360° panoramic footage and photos can be used within a slideshow, and there is also the ability to extract segments of a panorama. Support for Current Video Formats - Photostory Deluxe supports a wide variety of current video, image, and audio file formats, including raw file types and HEVC/H.265 through an optional activation. Image Stabilization - Using fully the integrated Mercalli V2 plug-in from proDAD, shaky video footage, unsteady tracking shots, and uneven zooms can be stabilized. Correction is also available for additional unwanted effects, such as rolling shutter. Photo Border Effects - Using a drag and drop method, you can apply black borders to images to show them in a vertical/portrait orientation. Automatic Shot Match - Using a fully automated matching feature, images can be paired using color and tonal values to create a unified color scheme. Titles and Editing Templates - An assortment of preset templates and themes can be applied to match your images' content, including vacations, weddings, and gatherings. Picture-in-Picture Effects - Picture-in-picture collages can be created using a variety of templates for a dynamic appearance. Automatic Image Optimization - Color, contrast, brightness, and saturation can be adjusted automatically or manually to generate a desired look. HDR Effects - Adjustments can be made to extend the tonal range for improved highlight and shadow detail. Secondary Color Correction - Selective color editing lets you solely adjust specific colors to make a blue sky bluer or a red wall redder without affecting the overall color balance. Red-Eye Correction - Remove unwanted red-eye effects with a single click. Title Editor - Titles, opening and closing credits, chapter markers, and subtitles can be entered directly into the preview window and precisely placed within the frame. Change Picture Perspective - Photos can be added to motifs and positioned and oriented within them. Travel Route Animations - An animated map can be added to show the travel route comprised in your imagery. The map animations can be customized by displaying the mode of transportation, ranging from airplanes to motorcycles, as well as the defined stops along the way. Panoramas - Individual images can be combined to produce a seamless panorama and automatic focal length detection as well as distortion and perspective correction can be applied. Create 3D Effects - Unique 3D effects combine individual images to produce realistic-looking 3D results. Artistic Filters - Filters can be applied to an image using a single click. Facial Recognition - Automatic recognition of faces within a frame helps to prevent unwanted cropping when making zooming and panning shots. Tracking Shots and Zooms - Important content and subjects can be highlighted using dynamic zooms and pan shots. Decorative Elements - Over 130 templates, including audio and effects sounds, as well as a variety of intro and outro elements, can be applied to presentations for a cohesive and creative production. Transitions - A variety of dissolves and other animated transitions can be used between images in your slideshow. Menu Templates - For a finishing touch, interactive menus can be added to give a professional appearance during playback. Print Personalized Cases and Labels - MAGIX Xtreme Print Studio is included to help in producing CD/DVD covers and labels to apply to your finished discs. Rhythmic Slideshows - Pictures and video clips can be set within the slideshow to match the beat of the music. Snap markers can be set on the timeline while listening to music, which then make it easy to drop in imagery later to sync up to the music. Automatic Volume Regulation - Voice-over volume is automatically adjusted so it is always clear and easy to hear. Audio Dubbing - If you're having trouble deciding on music, a library of more than 750 songs and sounds is available for use. Soundtrack Maker - Included MAGIX Soundtrack Maker automatically creates background music according to the slideshow's theme, varying from suspense, to action, to fun. Export Wizard - A dedicated wizard guides you through exporting your finished slideshow in a variety of playback formats. Transfer to Mobile Devices - Finished productions can be formatted and transferred directly to a mobile device for seamless playback. Burn Slideshows to a Disc - Finished slideshows and animated menus can be burned to DVD or Blu-ray discs for easy playback. Social Media - Export and format finished production directly to social media sites, like YouTube, Facebook, and Flickr. Present on Websites - Productions can be formatted to play within media players for easy streaming via web browsers.